In our parish members of the group confine themselves to visiting the bereaved a number of weeks after the death of a loved one. Usually two members will call at the home of the relatives of the bereaved and ask if they would like a visit there and then. Many parishioners have benefited from such a visit but there is never any pressure on the part of the bereaved to feel that have to become involved with the bereavement team. In due course we would hope that members of the bereavement team would be available to pray with families at the time of the death of a loved one. One day perhaps, when it may not be possible for a priest to be present at a graveside or crematorium, members of the bereavement team might be able to conduct the final prayers of commendation. Although grieving is a natural process which can be helped by the sympathy and understanding of friends, sometimes a bereaved person may need support to work through it in a positive way. Friends don’t always know how to help. They may be embarrassed by gried or they may avoid meeting a bereaved friend, believing that a meeting may increase distress. It is quite normal to feel anger, guilt, fear and depression as well as the awful pain of loss. These feelings need to be expressed rather than repressed, to be talked out, cried over and put in some sort of perspective. 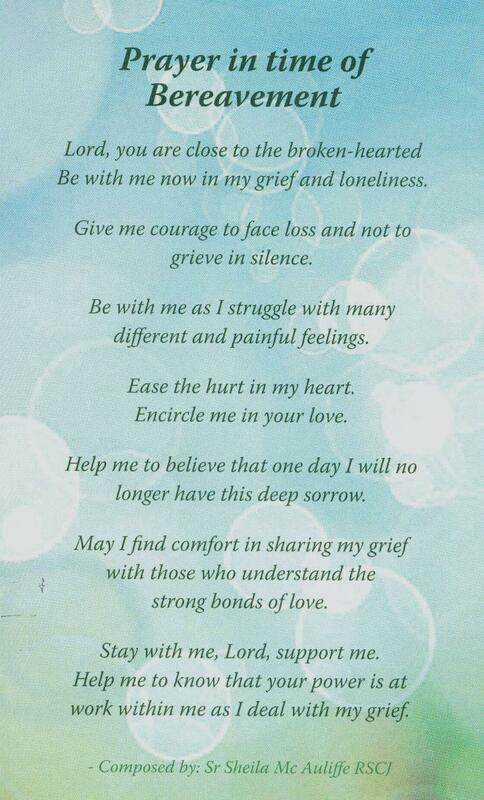 It helps the healing process to talk with a trained listener and confront the vey strong feelings associated with grief. Many Bethany members have themselves been bereaved. They are trained to listen with understanding. They accept those suffering loss as they are, and support them through the grieving process.